Go south to Zakopane for Goralskie culture and mountain scenery. Sleigh rides complete with jingle bells are still a reality in Poland in the winter. Fur coats and rugs are sold in the shops and markets. The various ways of getting to Cracow and around Cracow. Poland is an inexpensive skiing destination. Snow is generally good enough for skiing from New Year until the end of March in southern Poland. 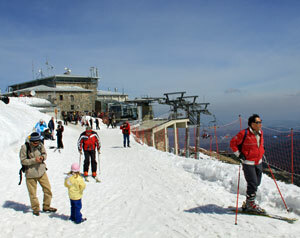 Places such as Kasprowy Wierch in Zakopane (shown on the left) may have snow until the 1st week of May. The snow is usually deep enough for skiing from the 2nd of January, right after New Year. That's the traditional time for the skiing season to begin and when visitors tend to descend on Zakopane ski resort and the smaller towns of southern Poland. Visitors generally come just before New year to enjoy New Year in Poland with fireworks, a dinner dance and plenty of alcohol. By the second of January, everyone has recovered are are keen to take to the ski slopes. Skiing in Poland is popular with Russian people, especially those from Kaliningrad, just north of Poland. An increasing number of British and other nationalities have discovered Poland for skiing and are returning on a regular basis because costs are lower for ski passes, instructors and ski hire. Eating out is still cheaper in Poland than many other European countries, Poland does not yet have the Euro. In addition to skiing there is snow boarding, skidoo hire and ice skating. Poland is a wonderful outdoor playground during the winter. The season is shorter than in the Alps because the Tatra mountains are lower but come any time between the end of December and March for a good time in the snow. The best possible winter holiday to Poland would be beginning on the 28th of December when the Cracow Christmas Market is still open, enjoy New Year in the main square in Cracow then head for the Tatra mountains or Beskids south of Cracow to ski and ice skate. The town of Zakopane is lively and busy and there are plenty of other smaller towns in the area with excellent skiing such Rabka Zdroj, Czorsztyn, Nowy Targ. 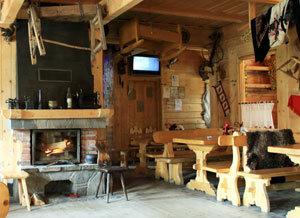 Enjoy apres-ski in Polish traditional restaurants for high calorie energy Polish meals and plenty of mulled wine and vodka. Copyright (c) 2011 cracow-christmas-market.co.uk All rights reserved.